Well, would you look at dees. 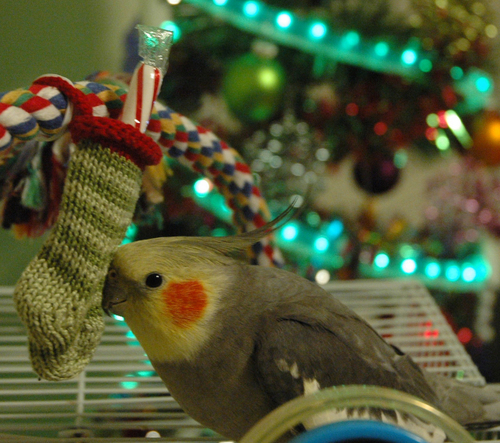 A bird-sized stocking. Looks like the hamsters are finally including me this year. [Looks up and sees candy cane] "Oh, thank you so moche!" No, thank YOU so moche, Monica A. and Steve the bird. that is absolutely precious. the look on that sweet birdie's face just melts my heart. mm... feels like more in da bottom of dis stocking. wonder if i can get it down without anyone knowing? these wee birdies are so lovely - they are real characters. I just LUV how they have little colored cheeks! i love the name "steve" for a bird. how funny. and the little smile! i am ded from teh cute! Aaaawwww....who knew birdies could be so gosh-darn cute? Awwwwwwies! I wants to kees ze proshie pink birdie cheeks! Merry Christmas, tweetheart! AWWW! "Sing to the candy cane, sweetie!" I have 3 'tiels, and they are wonderful birds. He's glowing! He lurves his new stocking. awww, what a happy looking dude!! Awww, look at his widdle stocking! He likes it! Look, he's smiling! Bleen! "We're sorry, your comment has not been published because TypePad's antispam filter has flagged it as potential comment spam." JT, I think our Beloved Leader has had to extra protect our CO from nasty virooses - see below. I am having to authenticate every entry. Small price to pay for the QTE. Which is what Mr Steve McBirdiepants is - QTE! Putting makeup on a bird could make them sick!! I'm calling the bird police! I want a teeny stocking to give my tiely boy. the birdie is so happy! so full of smiles and Christmas spirit! Oh noes! I forgot to get a stocking for my cockatiel! Thank you for reminding me! Here's hoping Chuey will look as completely blissful when he gets his. Can he wait till Christmas, without opening it? This warms my heart. I love people who love their pets so much. All pets should be so lucky! Oh no - what a dilemma - should the birdie replace my "kitten kneading fairy lights" screensaver? I love that look on his face. He can't wait for Christmas morning, he knows what's coming. That is a killer smile! And "seedy place" jen? LOL! As a knitter, I definitely admire the bird (he is adorable! ), but also feel a pressing need to know if Steve's mom made the stocking! Oh noes, I am luncheon meat! That stocking is way too big for that birdeh's foot. Here's another one: My rabbit has a keychain with a human foot on it. The weird part is, I don't know what the keys are for. A 'tielee size stocking. My little ones will be so jealous if they see this. If mamma knit that, she has some teeenincey little needles. I don't know much about birds, but he looks so happy!!! What a sweet, happy smile! Awwwwww! How precious! My 'teil would run away from the stocking for at least a day before inspecting it, I fear. This is definitely my new desktop! The paint on this bird could be toxic!! :( I'm calling the Polly Police!! That is an adorable stocking. Maybe I should have knit some for my critters this year. Oh well, maybe next year. Question: Is the candy cane just for show, or will the bird get to keep it? And how does a bird on a sugar high behave? High on the BEF too! Hee - I decorated my rabbit's "condo" with tinsel and wooden (nom-safe) ornaments. I am quite sure she disapproves though. With those rosy birdy cheeks, this feller could be a cartoon... or a Who from Whoville. Yes, yes, this i definitely Whoterritory. I hope he gets to keep that candy cane, or at least gets a facsimile dipped in sunflower seeds. Nom nom nom ho ho ho! OMG - ded from cuteness - this warms me to the bottom of my birdie-loving heart - all pets should be lovvvved this moiche! Awwwww, what a cute birdy with those blushing cheeks!!! And he's smilingks!!! Hasn't anybody noticed that the stocking is knitted in colors that match the birdie's plumage? This is SO cute! 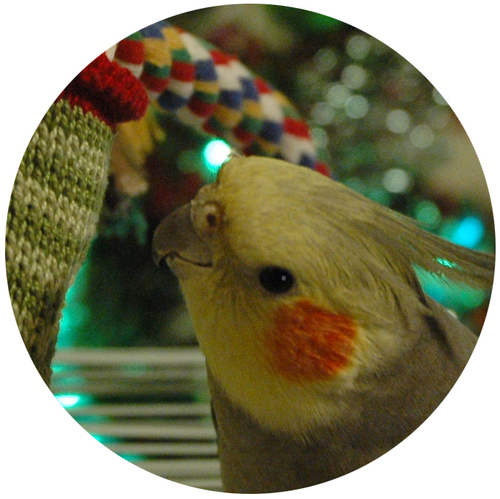 And if Steve is anything like my cockatiel Judah, he's butting his head against the stocking in that first shot in an effort to get it to give him scritches!